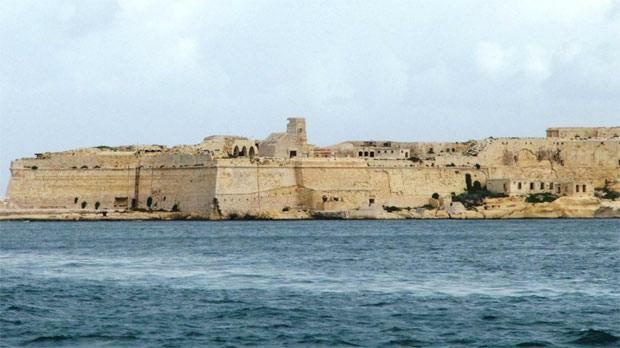 View of Fort Ricasoli from Valletta. In December 1803, three years after the French occupation of Malta was brought to an end by the combined efforts of the Maltese population and British forces, a certain Count Froberg was granted a Letter of Service by Britain’s Secretary at War to raise a regiment in Germany for service in Malta. Such Letters of Service were frequently issued to British agents in Europe during the Napoleonic Wars. Froberg was a French Royalist whose real name was Gustave de Montjoie, and according to Adam Neale, writing in his 1813 work Travels Through Some Parts of Germany, Poland, Moldavia and Turkey, he had “passed himself upon the British government” as the German Count Froberg. The spurious count immediately set about recruiting for the Froberg Levy, as the regiment came to be called, in Albania and the Christian parts of Turkey, and had managed to assemble a force consisting of about 500 men by 1806, when the levy first arrived in Malta. The recruitment practices employed by Froberg were dubious to say the least, and Neale remarks that “the most unprincipled deceit and falsehood were employed to obtain recruits”. The resulting regiment consisted of a motley group of Germans, Poles, Swiss, Albanians, Bulgarians and Greeks. With such a miscellaneous assemblage of nationalities, each with its own language, religions and customs, the successful future of the regiment could certainly not be taken for granted. Furthermore, many of the rank and file of the regiment had been enticed to join up as ensigns and captains with promises of high pay and allowances. When they arrived in Malta, however, they were forced to do duty as privates, receiving much lower wages. Sure enough, there was great discontent among the men, and things came to a head soon after their arrival in Malta, eventually leading to a most inglorious end for Froberg’s regiment. On arrival in Malta, the men were quarantined at Lazzaretto, and while there, they complained bitterly about their forced passage to Malta and demanded to be sent back to Corfu. The regiment was under the overall command of Major Schumelketel, but the men were under the direct control of Lieutenant Schwartz, the tyrannous officer who had supervised the infamous recruitment process. It was only after Schwartz threatened to withdraw their food rations that they submitted. Eventually they were confined to Fort Ricasoli by Villettes, and only allowed to visit the city in small groups. 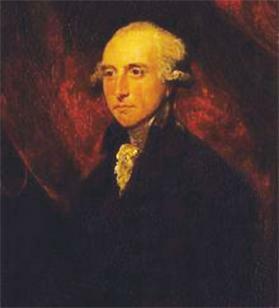 Villettes also appointed Lieutenant-Colonel James Barnes of the 4th Regiment as commander of the levy in November 1806. This only served to increase their resentment, and the situation soon boiled over. On April 4, 1807, while Barnes was in Valletta, about 200 Greeks and Albanians, having decided to escape from Malta and return to Corfu, attacked their commanding officers, killing the infamous Schwartz and severely wounding Schumelketel and three other officers. 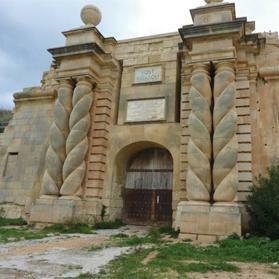 The gates of Fort Ricasoli. Observers in Valletta heard musket fire and observed signs of disorder in the fort. Soon after, the British flag was hauled down and replaced by the Russian ensign. The drawbridge was taken up and the gates to the fort closed. That a mutiny was under way was confirmed when the riotous soldiers were observed forcing the 20 or so British artillerymen stationed in the fort to train their loaded guns and mortars across the harbour towards Valletta. In the meantime, some men who had managed to escape, reached Valletta, bringing the news that Schumelketel had been severely wounded and Schwartz and another officer, Capt. De Wattville, ruthlessly murdered. An artilleryman, Gunner John Johnstone, was also killed when he refused to surrender the keys of the armoury, while a number of privates had also lost their lives during the start of the mutiny. On receiving this highly disturbing information, the British authorities on the island immediately took steps to quell the rebellion. The British troops were called out and the 39th regiment was ordered to march on Fort Ricasoli. The guns of Fort St Elmo were manned and trained on the fort occupied by the rebels. 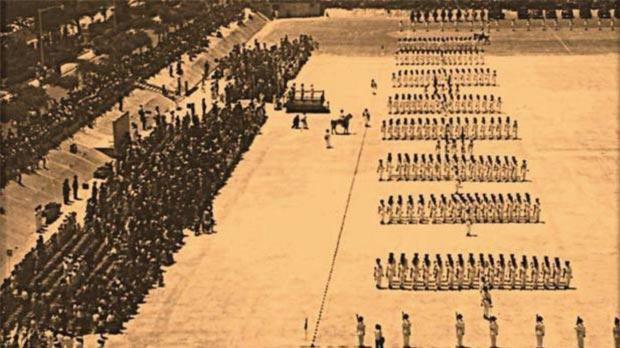 The Royal Maltese Regiment, which had been founded by Villettes in 1803, and which was quartered in nearby Vittoriosa, were the first to arrive outside the fort. They took up position on the glacis in the cover of some stone walls. Soon after they were joined by the 39th regiment. Villettes had meanwhile received a message from the mutineers in which they demanded the discharge of the regiment, ships to convey them home, money and a free pardon. Unless these demands were met, they threatened to fire on the city of Valletta and do all possible mischief. Villettes, of course, refused to have any dealings with them and ordered their immediate surrender. On the following morning, great precautions were taken to ensure the safety of Valletta. The guns of Fort St Angelo were manned and trained on Ricasoli and more cannon were emplaced on the Valletta bastions and protected by breastworks of sandbags. All artillery pieces pointing towards Fort Ricasoli, consisting of no less than 170 cannon and 24 large mortars, were held in readiness to fire. On the landward side of the fort a blockade was maintained by a strong body of troops. However, no further action was taken, and it became clear that Villettes had settled on besieging the fort with the intention of forcing surrender by famine. This prudent course of action came in for some criticism, both during and after the event, since some were of the opinion that more decisive action should have been taken to nip the mutiny in the bud. Part of a letter dated April 16, 1807, sent to William Windham, Secretary of State for War and the Colonies, extolling the suppression of the Ricasoli mutiny by Lieutenant-General William Villettes. 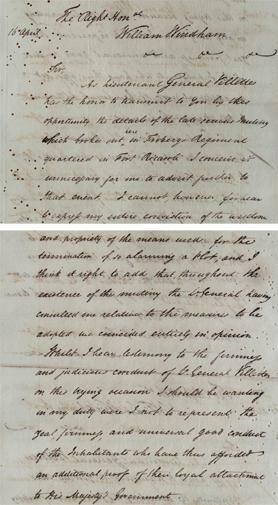 This is borne out by the fact that after the suppression of the mutiny, a letter extolling the strategy adopted by Villettes (“I cannot however forbear to express my entire conviction of the wisdom and propriety of the means used for the termination of so alarming a plot”) was sent to William Windham, Secretary of State for War and the Colonies in the British Cabinet. Ironically enough, Windham was no longer Secretary of State, as the government he formed part of had fallen on March 25, 10 days before the mutiny broke out. News took longer to reach Malta in those days! The lack of any direct action by the British authorities was perceived by the rebels as a sign of weakness, and their confidence increased. They sent a second message to Villettes, arrogantly demanding food and provisions for 800 men, in default of which the bombardment of Valletta would start. This second message was ignored, other than to order return of fire should the rebels start hostilities. Although Villettes could have forced the surrender of Fort Ricasoli without great difficulty, he was being extremely cautious, knowing that if the fort was targeted, cannon and mortar fire would be unleashed against Valletta. Another consideration was that the mutineers were holding a number of hostages who would be slaughtered in case of attack. These included the surviving regimental officers and their families, and the British artillerymen. William Windham (from a portrait by Joshua Reynolds). On the morning of April 6, the mutineers again decided to negotiate and sent one of the officers with another message for Villettes, which was a repetition of their previous demands. The officer’s wife remained in the fort as security for the officer’s return. This message was again treated with contempt, but the officer was in a position to give an account of the horrible circumstances in which he and his fellow hostages were being kept. A short time after this unfortunate messenger had returned to the fort, the first signs of confusion started to appear among the rebels: a white flag, indicating surrender, was hoisted, only to be taken down immediately. Further attempts were made to raise the white flag but these were forcibly opposed. This indicated dissent among the mutineers and the emergence of a faction that was ready to surrender. Encouraged by this new development, Villettes sent over a delegation accompanied by a number of Greek priests to negotiate with the rebels and to request their surrender, trusting in his clemency. However, the rebels persisted in their demands and threats. The fourth day of the siege passed without any significant development, but on the morning of April 8, to the authorities’ great surprise, the wives and children of the regimental officers were released. The gates were immediately closed after their departure. It was now clear that the mutineers were suffering great distress due to the lack of food and provisions. They became even more desperate and hostile, threatening to bring the episode to an end in the most horrible way they could devise. They sent an ultimatum, threatening to blow up the fort and everything in it, including themselves, unless the necessary provisions were sent to them by a certain hour. On expiry of this ultimatum, another was sent in which they swore to massacre every officer and Englishman in the fort if their requests were not acceded to. When this was again unsuccessful, they gave notice of their intentions by removing Captain Fade of the artillery from his post on the bastions; as he was carried away, this gallant officer signalled his probable fate to his fellow officers outside the fort and threw his sword and sash into the ditch. This incident increased the tension among the men surrounding the fort and those training their guns on Ricasoli. Every man was at the ready, eagerly awaiting a signal from the Palace to start fire from all batteries. Inside the fort, trouble again broke out among the mutineers. Later in the day, a number of disgruntled Germans and Poles overcame the sentries and opened the gates of the fort. The vast majority of the rebels, who had come to the conclusion that their cause was lost, rushed out, but a small group of diehards closed the gates and remained inside. On March 10, this small group tried to im­prove their negotiating position by firing across the harbour to Valletta. This was the last straw for Villettes, who decided the fort should be stormed without further delay. Under the command of Lieutenant de Clermont of the Froberg Regiment, a scaling party numbering around 40 hand-picked men attacked the fort under cover of darkness and quickly gained control of the fort without any losses. However, a group of six rebels retreated into the magazine and threatened to blow it up if their demands were refused. Two days passed, and during the night of March 12 they carried out their threat and blew up the magazine, killing three British sentries. It was assumed that the six had also perished but they had, in fact, managed to escape in the confusion and made their way to the countryside, where they were captured a few days later and taken into custody. Villettes immediately convened a trial of the ringleaders, and 24 of them were found guilty and executed in the presence of the other members of the Froberg Regiment, now disarmed and made prisoner. In a letter to General Fox, Villettes described the executed men as “ferocious savages [who] in the last moments of their existence testified such horrid proofs of extreme depravity and barbarous profaneness, that it was quite shocking to the beholder, and the most disgusting scene possible for troops to be exposed to witness”. Floriana parade ground in the 19th century, scene of the grisly execution of the Ricasoli mutineers. He did not, however, describe the horrible methods used in the executions, which took place on the Floriana parade ground. The first five of the condemned were hanged by five others, who were themselves hanged in turn by the next five. The latter five, together with the remaining prisoners, were then handcuffed and shot without being blindfolded. Some did not die outright and tried to run away but were pursued and finished off. The British authorities also set up a board of inquiry which met between April 20 and 22. The board heard the evidence given by Schummelketel and the other officers of the regiment, who described the dramatic events that took place during the mutiny. The lower ranks also gave evidence, most giving a detailed account of the shameful way in which they had been enlisted under false pretences. Among its findings the board concluded that “a system of iniquity [was] practised in the recruiting of that corps of the most culpable and even criminal nature”. Since about 350 men were considered to have reasonable grounds for discharge, the Froberg regiment was disbanded in June 1807 and the men repatriated to the Balkan states. Those who desired to remain in service were reassigned to other foreign corps in British pay. Froberg himself, or more properly, de Montjoie, also came to a grisly end. Neale recounts how Froberg was at Russian headquarters in Istanbul when news of the mutiny arrived. His illicit recruitment methods, which were the root cause of the mutiny, were uncovered, and since he was also in debt to the government, he deserted to the French.